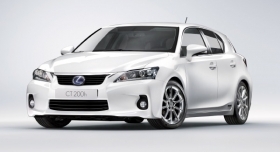 The Lexus CT 200h will rival the BMW 1 series and Audi A3. Lexus has released details its new CT 200h car, the first full hybrid vehicle to be launched in the premium compact segment. The CT 200h was designed and developed with the European market in mind but will be sold worldwide, Lexus said. The model will go into production in late 2010 as a rival to the BMW 1 series and Audi A3. The CT 200h hybrid drivetrain is the same as the unit in the Toyota Prius. It combines a 1.8-liter gasoline engine with a electric motor. The car can run on electric power for up to 1.2 miles (nearly 2km) at speeds up to 28 mph (45 kph). The CT 200h "will provide a new gateway to the Lexus range and attract new, younger customers to the brand," the carmaker said in a statement. The CT 200h's exterior is styled for maximum aerodynamic efficiency and minimum wind noise.